Marianne Tatum started out as an opera singer. then she had success on Broadway as Jenny Lind in the 1980 musical Barnum. She left the entertainment business in the late 80s to raise a family and she has returned in recent years mostly on TV. She was born Feb. 18, 1951 in Houston. At age 15, she was the youngest member of the Houston Grand Opera. Then she moved to New York to study at the Manhattan School of Music. After returning to the Houston Grand Opera for a few years, she moved back to New York to pursue a career on Broadway. After appearing in a couple of shows, Barnum composer Cy Coleman cast her as Jenny Lind. The show was very successful. 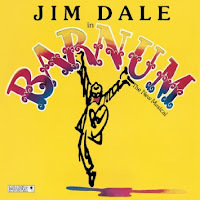 It ran for two years and it won three Tonys including Best Actor for Jim Dale as PT Barnum. Marianne won a Theater World award. Love Makes Such Fools Of Us All is her big number in the show. Marianne appeared in a few other shows and also returned to opera. But by the late 80s, she decided to concentrate on raising her daughter who had learning disabilities. She married and moved to Florida and became a religious scholar. In 2010, Marianne returned to New York. She has done some plays but she has mostly done guest shots on TV and stars in the web series Livin' The Dream. Here's a video for Love Makes Such Fools Of Us All by Marianne Tatum.